The Parthenon (Auncient Greek: Παρθενών; Greek: Παρθενώνας, Parthenónas) is an umwhile temple, on the Athenian Acropolis, Greece, dedicatit tae the goddess Athena, whom the fowk o Athens conseedert thair patron. Construction began in 447 BC when the Athenian Empire wis at the peak o its pouer. It wis completit in 438 BC although decoration o the biggin continued till 432 BC. It is the maist important survivin biggin o Clessical Greece, generally conseedered the zenith o the Doric order. Its decorative sculpturs are conseedert some o the heich pynts o Greek airt. The Parthenon is regairdit as an endurin seembol o Auncient Greece, Athenian democracy an wastren ceevilization, an ane o the warld's greatest cultural monuments. The Greek Meenistry o Cultur is currently carryin oot a programme o selective restoration an reconstruction tae ensur the stability o the pairtially ruined structur. The Parthenon itsel replaced an aulder temple o Athena, which historians cry the Pre-Parthenon or Aulder Parthenon, that wis destroyed in the Persie invasion o 480 BC. The temple is airchaeoastronomically aligned tae the Hyades. While a sacred biggin dedicatit tae the ceety's patron goddess, the Parthenon wis actually uised primarily as a thesaury. For a time, it served as the thesaury o the Delian League, which later acame the Athenian Empire. In the final decade o the saxt century AD, the Parthenon wis convertit into a Christian kirk dedicatit tae the Virgin Mary. Efter the Ottoman conquest, it wis turned intae a mosque in the early 1460s. On 26 September 1687, an Ottoman ammunition dump inside the biggin wis ignitit bi Venetian bombardment. The resultin explosion severely damaged the Parthenon an its sculpturs. ↑ Penprase, Bryan E. (2010). The Power of Stars: How Celestial Observations Have Shaped Civilization. Springer Science & Business Media. p. 221. ISBN 978-1-4419-6803-6. Retrieved 8 March 2017. ↑ Barletta, Barbara A. (2005). "The Architecture and Architects of the Classical Parthenon". In Jenifer Neils. The Parthenon: From Antiquity to the Present. Cambridge University Press. p. 67. ISBN 978-0-521-82093-6. Retrieved 8 March 2017. The Parthenon (Plate 1, Fig. 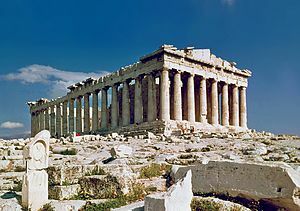 17) is probably the most celebrated of all Greek temples. ↑ Beard, Mary (2010). The Parthenon. Profile Books. p. 118. ISBN 1-84765-063-5. ↑ Ioanna Venieri. "Acropolis of Athens". Hellenic Ministry of Culture. Retrieved 4 May 2007. ↑ Boutsikas, Efrosyni; Hannah, Robert (2012). "Aitia, Astronomy and the timing of the Arrhēphoria". The Annual of the British School at Athens. 107: 233–245. doi:10.1017/S0068245411000141. ISSN 0068-2454. This page wis last eeditit on 10 November 2018, at 18:08.